University College’s grandeur peeks through the swaths of plywood where renovations are currently underway – revealing close-up views of intricate stained glass windows and the storeys-high dome of the Croft Chapter House. The renovations, which are expected to be completed in early 2020, were made possible thanks to an increase in ancillary fees for UC students and donor gifts, including $3 million from Paul Cadario, U of T alumnus, former member of the Governing Council and a former manager at the World Bank, and a $2.5-million donation by Edmund and Frances Clark, who come from a multi-generational family of UC alumni. Edmund Clark is the former CEO of TD Bank. The Clarks also gave $2.1 million to update the UC quad after the interior renovations are complete. Donning a hard hat and protective boot coverings, University College Principal Donald Ainslie took U of T News around UC to see how the building is being transformed. The centrepiece of the UC revitalization is the library, located in the East Hall. The room is anchored by archways on one side and a sleek, curved white staircase on the other, which leads up to a mezzanine that wraps around the room’s perimeter. UC library’s new home isn’t actually new at all – it was where the library was originally located before a fire destroyed it in 1890. The accessible mezzanine is a nod to the one that existed before the fire – and allows for up-close views of stained glass windows that were installed in 1911. The trio of stained glass windows (pictured below) commemorate the three U of T students who died in the Fenian raids. Ramps connect each new room in UC – making a building that used to be hard to navigate much more accessible. Work to make the building more accessible includes installing a new elevator, which can be seen from the quad, and adding an accessible entrance at the front of the building. “That's a really important change and one that's central to what we're trying to do,” Ainslie says. Inside the Croft Chapter House, the darkened dome is now a bright white (pictured above), with carved wood beams meeting below a halo of windows. This where the Paul Cadario Conference Centre will be located – a modular space allowing for different types of gatherings. A glass wall will be installed near the entrance to the Chapter House, which will be inscribed with a line of poetry written by Anne Michaels, a UC alumna and outgoing Toronto poet laureate, and translated into 150 languages currently spoken in Toronto. Creating functional spaces was an important aspect of the revitalization for Ainslie. “That was something I certainly realized when I started as principal, that the college had a lot of underutilized space,” he says. 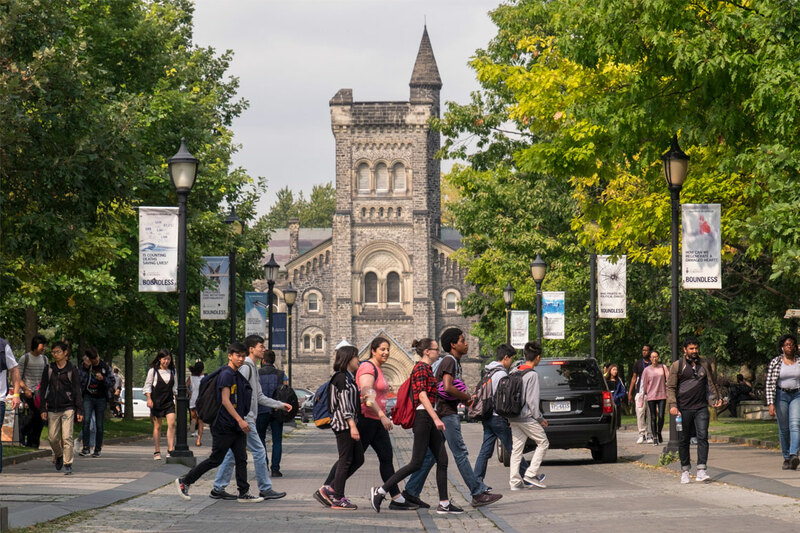 “Thus one goal of the revitalization is the development of new spaces that will bring UC students and the whole U of T community into this great building." Two classrooms are being upgraded as part of the revitalization project, says Ainslie. Both will be “super smart and super flexible,” outfitted with multiple screens, allowing for two-way conferencing and designed for team-based learning. UC partnered with the Faculty of Arts & Science and Academic + Campus Events to create spaces that are optimal for different ways of learning and teaching. While upgrades are important and necessary, honouring the heritage of UC was an important part of the revitalization project, says Ainslie.